Coriander | Kitchener Portuguese Club Inc.
Posted in: Friday Night Socials. Tagged: $10, 10th, All Are Welcome & Bring Friends, Carne de Porco à Alentejana, clams, Coriander, friday, KITCHENER PORTUGUESE CLUB, Meat, night, November, pork, potatoes, Small Side-Bar, Snack, social. This Friday night, Nov. 10th, at 6:30pm, the Small Side-bar of the Kitchener Portuguese Club, will be open as usual! The snack for this evening will be a very tasty and traditional Portuguese entree, Carne de Porco à Alentejana, (similar to the photo below but, NOT necessarily in the way shown). Carne de Porco à Alentejana is one of the most traditional and popular pork dishes of Portuguese cuisine. It is typical from the Alentejo region, in Portugal, hence the word Alentejana. 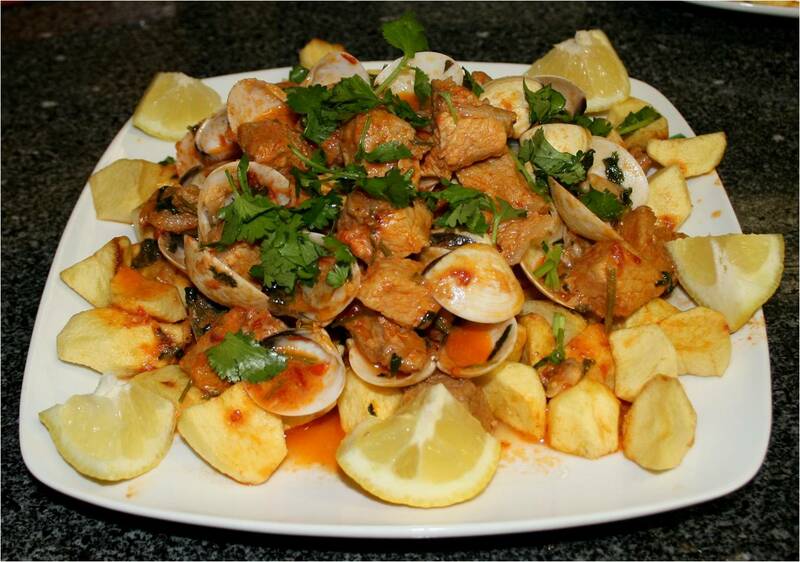 It is a combination of pork and clams, with potatoes and coriander. Posted in: Past News and Events. Tagged: $10, $20, $25, 11th, 2017, 6pm, 7pm, Carne Alentejana, Children, clams, Coriander, Dance, dinner, DJ Music Nation, Doors, February, Jose Lourenco, KITCHENER PORTUGUESE CLUB, Main Hall, Meat, Members, Menu, Non-Members, pork, potatoes, Prices:, Reservations, Saturday, Soup, Valentines, Vitor Sebastiao. Doors open at 6pm | Dinner will be served at 7pm. Menu: Soup, Carne de Porco à Alentejana, (a meal of pork and clams, with potatoes and coriander) and Dessert. Dance Music provided by: DJ “Music Nation”. Prices: Members $20 | Non-Members $25 | Children $10 | $ 5, just for the dance, the door around 9:30pm. For reservations, contact: Victor Sebastião: (519) 570-3772 or Jose Lourenço: (519) 749 – 9971. Posted in: Friday Night Socials. Tagged: 1st, clams, Coriander, friday, HAPPY CANADA DAY, July, KITCHENER PORTUGUESE CLUB, Meat, night, pork, potatoes, Small Side-Bar, Snack, social. This Friday night, July 1st at 6:30pm, the Small Side-bar of the Kitchener Portuguese Club, will be open as usual! The snack for this evening will be a very tasty and traditional Portuguese entree, Carne de Porco à Alentejana, (similar to the photo below). HAPPY 149TH CANADA DAY, ON FRIDAY!!!! Posted in: Friday Night Socials. Tagged: $10, 13th, 2016, clams, Coriander, friday, KITCHENER PORTUGUESE CLUB, May, Meat, night, pork, Small Side-Bar, Snack, social. In 24 hours, (Fri. May 13th at 6:30pm), the Small Side-bar of the Kitchener Portuguese Club, will be open as usual! Posted in: Friday Night Socials. Tagged: $10, 2016, 8th, April, clams, Coriander, Cubbed, friday, KITCHENER PORTUGUESE CLUB Saturday, night, pork, potatoes, Side-Bar, Small, Snack, social. In 24 hours, (Fri. Apr. 8th at 6:30pm), the Small Side-bar of the Kitchener Portuguese Club, will be open as usual! Valentine’s Day Dinner & Dance – Sat. Feb. 13th. Posted in: Past News and Events. Tagged: 13th, 2016, 6pm, 7pm, band, Brazza, clams, Coriander, Dance, dinner, Doors, February, KITCHENER PORTUGUESE CLUB, Main Hall, pork, potatoes, Saturday, Supper, Valentines. Valentine’s Day Dinner & Dance. Menu: Carne de Porco à Alentejana, (a meal of pork and clams, with potatoes and coriander) and Dessert. Dance music provided by the band: “Brazza”. Price: Members $20 | Non-members $25 | Children $10 | $5, only for the dance, at about 9:30pm, at the door. For reservations, contact: Vitor Sebastiao: (519) 570-3772 or José Lourenço: (519) 749-9971. Posted in: Friday Night Socials. Tagged: $10, 11th, 2015, clams, club, Coriander, Cubbed, December, friday, kitchener, Meat, night, pork, portuguese, potatoes, Side-Bar, Small, Snack, social. This Friday night, Dec. 11th at 6:30pm, the Small Side-bar of the Kitchener Portuguese Club, will be open as usual!